Please call 52 616 486 (Follow Prompts) or come to the hospital immediately. Emergencies are accepted anytime our clinic is open, unfortunately this often means clients coming in for an appointment may need to be patient while we attend to a crisis. 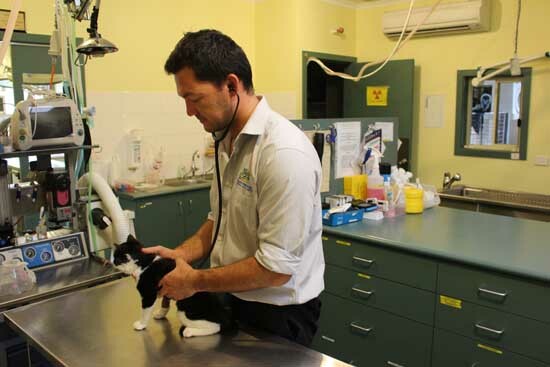 We usually have two veterinarians and experienced nurses on duty 6 days a week who are fully trained and equipped to handle any needs your pet has. If possible it is best to call before coming in so that a staff member can advise you on your particular emergency. Emergencies can be things such a snail bait poisoning, being hit by car, bad fight wounds and snake bite. If you feel you have an emergency with your pet, please call us on 52 616 486 or come to the hospital immediately. We provide an afterhours service for our clients animals and regularly have hospitalised patients that are cared for overnight & through weekends, holidays etc.